Each case contains 6 (2) pounds cans of Dehydrated Potato Dices. 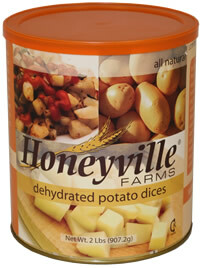 Honeyville's premium quality dehydrated potato dices are an excellent nutritional food source for family preparedness. Each #10 can contains 2 pounds of our delicious diced potatoes. All cans are sealed airtight and include an oxygen absorber for optimal storage life and freshness. Honeyville dehydrated potato dices may be used as breakfast potatoes or in casseroles and bakery recipes calling for potato dices. Dehydrated potato dices may be stored in original sealed, oxygen-free cans for up to 10 years. Instructions: Place dehydrated potatoes into bowl or container. Add enough boiling hot water to just cover all of the potatoes. Allow the potatoes to absorb the water for approximately 15 minutes. Potatoes are now rehydrated similar to raw potato and ready to cook. Enjoy!